Christmas in New Zealand is a time for heading out to the beach, seeing family, catching up with friends and enjoying all that Summer can offer. As gamers some of us did our best to avoid these things and instead spent some quality time indoors painting figures (of course!). Our new Team Yankee book, Free Nations, has four nations in it, so a bunch of us have chipped in to help get stuff painted in time for the book to head off for printing. Chris took on the Canadians, Evan the Australians, and myself the Dutch. This left Aaron to concentrate on the French and anything that arrived later. 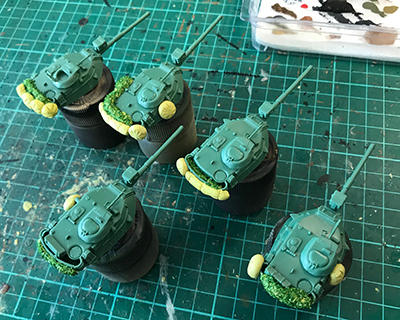 In my first batch I got four YPR-765 PRI infantry fighting vehicles, the support fire and transport for the Dutch mechanised infantry (which Aaron has already painted, but I plan to paint some for myself later). I’ve also painted two patrols of two M113 C&V recon vehicles, as well as three PRTL (the Dutch version of the Gepard) and four Leopard 2 tanks. All painted in a green tinged olive drab (West German Gelboliv), well, as close as I could match. Christmas time in New Zealand is summertime. With family commitments, and the heat, my ability to make a lot of hobby progress was hampered. However Stripes brought my favourite Main Battle Tank (the M60) into Team Yankee so I made sure to create some hobby time. Stripes introduced the United States Marine Corps into Team Yankee with all their distinctive equipment. After a bit of noodling I determined the I had to have both M60A1s and LAVs in quantity. 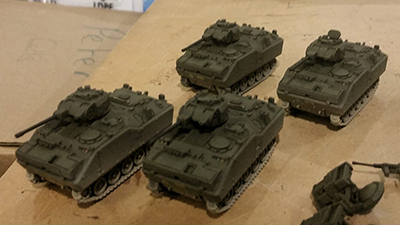 So I assembled ten LAV-25s (two full platoons, and the company command), four LAV-AT, and seventeen M60A1s as a core to a force that I’ll expand out over time. I wanted to personalise my Marines a bit, so I started to add a bit of external stowage, to help create a more lived in feel. I’m no Sculpter so I needed to keep the stowage relatively simple, so I ended up making some passable Duffle bags and rolled up tarps. I really wanted to add ALICE packs as well, but my experiments with Miliput were not yielding the results that I was after. Then I remembered the movie ‘Jarhead’ and trips to the local surplus store a couple of years after the first Gulf War … Pack covers were the answer. Armed with my limited sculpting skills I made some semi dome shapes and pressed in some basic cloth folds. They may not be the best ALICE pack covers, but at a game distance on the table I think that they will pass muster. Next I decided had to decide on a paint scheme. Because I had used pack covers I felt a desert theme was called for. A single colour would be the path of least resistance … so clearly I couldn’t take that. 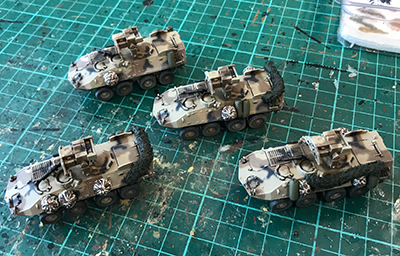 I saw a photograph of a ‘Grey Desert’ MERDC painted LAV-25 from the LAV test unit at 29 Palms in the 1980s so the colour scheme for my Marines was settled. 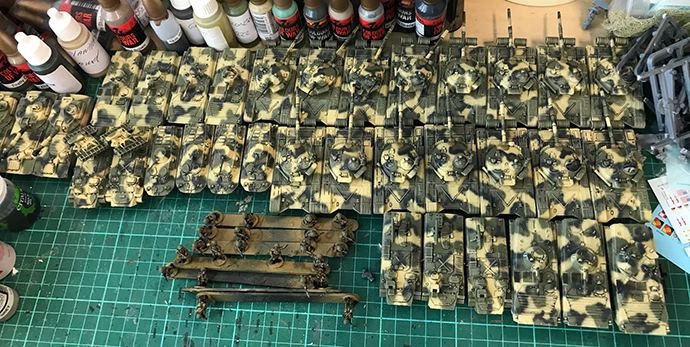 Late last year I painted the bulk of a Soviet force (above) in a three colour camouflage pattern, and while it looked okay I wanted to see if the envelope could be pushed. So I purchased a new airbrush with a 0.15mm needle in order to fully spray the camouflage. I decided the LAVs would be the vehicles to try this out on, and the LAV-ATs are the most unique looking ones so I sprayed a self-invented MERDC pattern on my four LAV-ATs and was happy enough with the result that I felt the models needed to be completed. 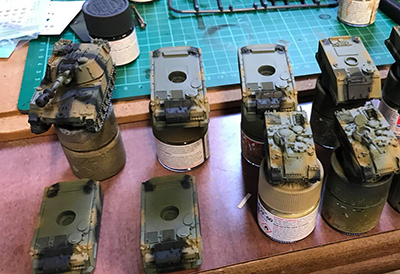 So I painted up the details and a simplified ‘Chocolate Chip’ camouflage pattern on the Pack Covers and called the job complete. On the back of that the rest of my Marines will follow suit. I’m looking forward to finishing the other models over the next little while and then adding some AAVP-7s with some infantry. Then seeing how the force evolves from there. If you like what Aaron has created with his external stowage on his LAVs then we have some exciting news. US Vehicle Stowage is now available for direct order in the web store. As Wayne mentioned a few of us have been working on armies for Free Nations over the Christmas break as the book is jam packed with new armies. 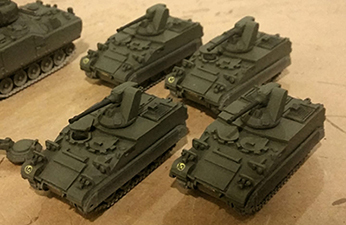 I've had a small pile of the old resin and metal Leopard 1 tanks (as opposed to the new plastic one coming our with Free Nations!) half finished for the better part of year so I saw the Christmas break as a chance to sit down and work on all the other support parts needed for my army. Luckily for me my in-laws live a few hours drive away so once I packed the family off for a few days of fun in the sun I settled down to some serious airbrushing in the garage (too cold for painting in the winter, too hot for painting in the summer!) 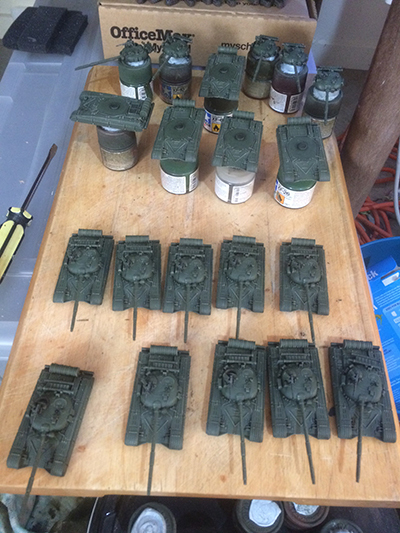 and managed to finish everything I needed except for the (still) half finished Leopard 1 tanks. 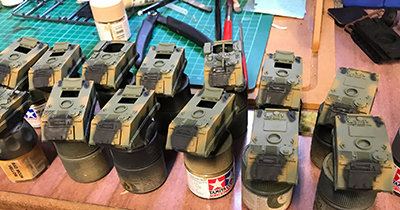 The Canadians, just like the Germans and Americans have a standard camo pattern for each vehicle so it was a case of sitting down with the airbrush and repeatedly doing the same swirls and lines in (hopefully) the same place. With a few months before the book actually comes out I have plenty of time up my sleeve to finish the army but for the time being I'll call my Christmas/Summer painting session a success. Over the break when I wasn’t on the beach I managed to get a bit of painting done. 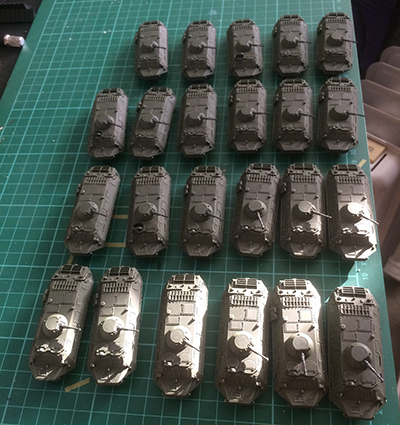 Currently I’ve got a whole lot of Team Yankee Soviets (23 BTR-60s and 15 T-64s) on my painting desk. They had all been airbrushed before the break, but now have all had their dust dry-brush applied and metal painted. The next couple of weeks should see them get a gloss varnish and decals applied. 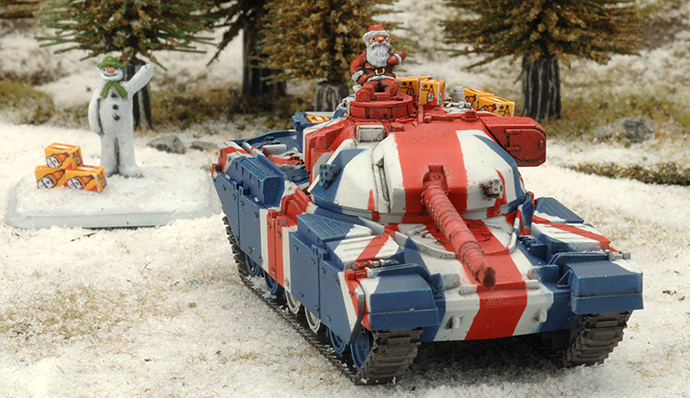 What did you get up to over the Christmas break? Let us (and the rest of the community know) know over on the Team Yankee and Flames Of War Painting and Modelling groups on Facebook.